Some shots from the interior of the Richmond Bar and Grill in El Segundo. My friend Casey and I stopped here last weekend after the Richmond Street Fair cause they were serving Bratwurst and Paulaner Oktoberfest beer. I really liked and was intrugued by a lot of the signs inside. 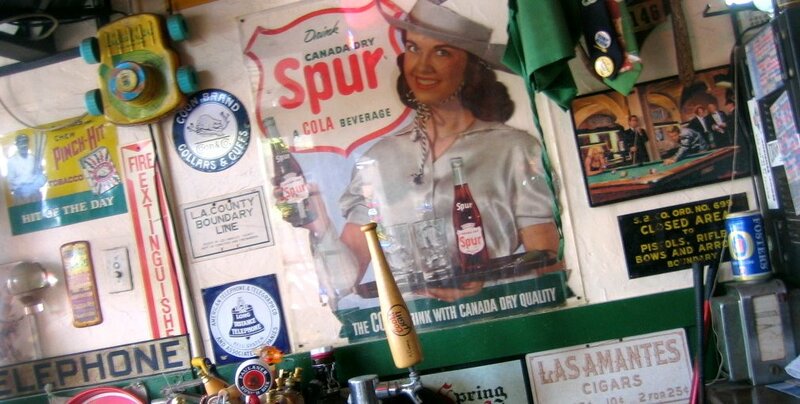 I had never heard of Spur Cola ("the cola drink with Canada Dry quality"). But I'm even more intrigued by Ted's Creamy Root Beer. As someone who became a big time baseball fan late in life (well, not in childhood at least), Ted Williams' story has always fascinated me. I was honored to see him in the All Century team at the 99 World Series, and saddened by the family fights that made headlines with his death. My friend Myron and I try to always have a hot fudge sundae at every All Star Game in his honor. Spur cola seems to still exist in Latin America, but is listed as a Coca-Cola product. Hundreds of Ted's Creamy Root Beer signs seem to be available for sale, but no information on if it ever existed as a real soda. Strangely familiar yet mysterious. Something odd and kind of fitting about that. The Chevron station near me has been undergoing a facelift. In May of 2005, Chevron changed their corporate name from ChevronTexaco to just Chevron Corporation. To go along with it, they changed their logo. Some articles say that it seems this was a bit of the former Chevron head sending a message to the former Texaco head that "I'm in charge". Reeerrrr. The existing Chevron logo had been in place since 1969. It seems there was no reason for the redo other than to "jazz it up". Even Chevron's own marketing and press material about the logo change only says "Moreover, our new corporate symbol will provide a more contemporary image for the forward-looking company we are today." In other words, the change doesn't mean anything or have any reason. Its yet another example of trying to fix something that wasn't broken. The chevrons are no longer chevrons, but now are 3D ribbons. The type is more current and softer (with some questionable sizing going on in the C), but like the new att logo, doesn't work so well with the logomark. When reproduced small in one color, its a mess. The old logo may not be historical genius like the old ups logo, but like ups they've sacrificed a classic bold logo for something trendy and reliant on full color applications to reproduce well. It isn't terrible, but just because you can, doesn't mean you should. I've been seeing ads for the new movie "Man of the Year" with Robin Williams playing a comedian who runs for President. The type treatment looks remarkably similar to the treatmeant for the tv show "Commander in Chief"... which looks remarkably similar to the type treatment for "The West Wing"... which looks remarkably similar to the type treatment for "An American President". What the...? Now, granted they're all nice and well done, but when did that become the only appropriate way to communicate 'presidential'? Surely after ten years we can find another way. My friend and photographer Tres from Dallas told me months ago about a great movie he had seen called "Sketches of Frank Gehry". Gehry is the architect of the Disney Hall here in LA, the Guggenheim in Bilbao, and several residences (including his own) here in Venice, CA. Tres said the movie is a fascinating look into not just Gehrey's work, but also the creative process. Today I got an email from him passing on that the film is now being shown on PBS as part of the "American Masters" series. It airs tomorrow (Wednesday) night in most places at 9pm. Check the link below for your local listings, and set your tivo so you won't have to miss Project Runway. When I was up in SF for the rodeo a week ago, my buddy Phil and I stopped at a quick-mart on the way back into the city after the rodeo. Apparently (from the way Phil recounts it), I just about jumped out of my skin when I stumbled on a box of Little Debbie Star Crunch snacks on a shelf. 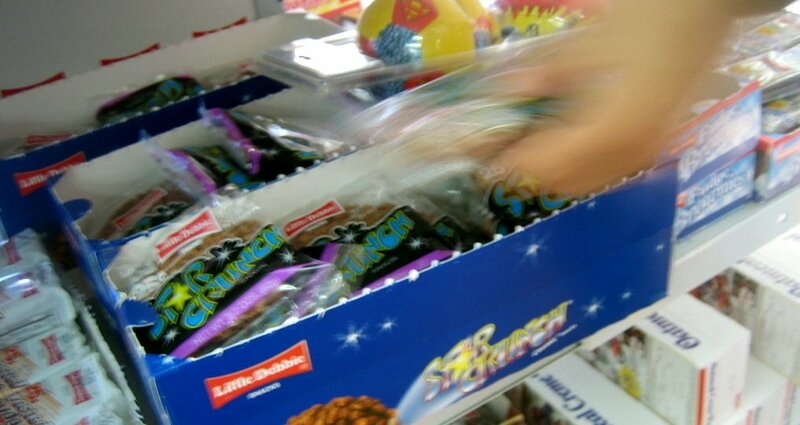 Star Crunches are one of my favorite junk foods. I don't know if my Mom ever bought them when I was a kid - somehow they seem way too junky for that - but I do remember buying them in college. (The things I could eat back then!) A Star Crunch is like a rice krispy treat with caramel added and covered in chocolate. And at only 25 cents, whats not to love? El Segundo is a little town that borders Manhattan Beach - its an amazingly cute little hamlet that almost seems trapped in time. Its locked in between a water treatment plant (so it has no oceanfront), the airport, and a huge Chevron refinery. In between is El Segundo - appropriately often referred to as 'Mayberry by the Sea'. Today they had the Richmond Street Fair, so I biked over to meet my friend Casey and strolled around. Inflatables seem to be popular! Lots of arts and crafts and a massage at the Beach Massage and Spa booth. The beer garden was a disappointment, but the Richmond Street bar and grill next door had some Paulaner and Bratwursts, so we ended up there before biking home along the beach. Little community things like this are part of what I love about living here. We're havin some fires here in LA. The weird thing about living here, especially since I've moved to the beach, is that a whole other part of the city can be - well, on fire - and you may never even know it. I snapped this yesterday driving in to the Dodgers game. I believe the fire is off in the San Gabriel Valley far past the city. One sort of twisted side-effect of the fires is that it creates some pretty amazing orange sunsets - even here at the beach. Once upon a time there was a tv show called "SportsNight". It was the first tv show written by this guy named Aaron Sorkin - who wrote some little projects like "A Few Good Men" and "The American President". I think to this day it is one of my favorite shows of all time. I was always sad when an episode ended - not because of the show, but because 30 minutes was never enough. For those of you that didn't watch it (probably most), it was a show about the staff of a nightly sportscast program like 'SportsCenter' similar in vein to the movie "Broadcast News" was to a news show. SportsNight was probably doomed to fail from the beginning. It wasn't a sports show, but the title led you to believe it was. ABC was never able to explain that in their marketing, despite their attempts to do so. It was a sit-com, but didn't feel like one. It was too smart and too serious - or so they say. ABC forced it to have a laugh track so people would understand it was a sit-com. It didn't fit. They kept moving it around on the schedule, never finding a home for it. And while its creator got sidetracked with another new little project called "The West Wing", SportsNight suffered and died a slow death. I didn't want to like "Studio 60 on the Sunset Strip." Probably because NBC was using its typical overdone, overwrought heavy handed promotion that never ends up being true. Although I knew little about the show, the promos made me want to see it fail. But then I saw the show. Within minutes I was drawn in to the point that I had to stop what I was doing and just watch. It is classic Aaron Sorkin, from the speed of the edits to the style of the dialogue to the wry and subtle expressions that can turn a scene. It didn't let me go, and I'm hungry for the next episode. Maybe I'm in a minority here. Studio 60 had a significant ratings drop from the show before it; and even more telling, the drop off of the second half hour from the first was just as significant. Its one thing if people didn't stay for the beginning of the show - its another one if they leave during it. Hopefully the show will stay at the level of quality that the premiere showed and not drift away like The West Wing. And hopefully it will find enough of an audience for NBC to stick with more than one season (if that). More shots from my weekend in SF... One of the things I love about both SF and LA is how easy it is to find yourself in "rural" areas just minutes away from the city, as well as right in the middle of it. I am always amazed how different SF feels from LA in that it is very much a NorthEastern-feeling urban city - easy to get around and live without a car, vibrant and alive with layers of history and culture. LA's growth into the second largest metro in the country is a more recent phenomenon, which is what I guess makes the differences so pronounced - with LA being a vast sprawling car-necessary city. How San Francisco's trolley and transit lines survived the time in the 50s when the big US Automakers bought and then dismantled them in most cities (including LA), I don't know. Along with its natural geography, I think its one of the things that has caused it to stay so rich. a few views from Saturday at the SF Rodeo... Beautiful drive along the ocean to the grounds sunken in a grove of trees...and oh yeah, they have beer. more to come, I got a rodeo to get to!